The Federal Trade Commission and the National Association of Realtors have issued a warning originators might want to pass on to their buyers. According to the FTC and the NAR, there’s a mortgage-closing phishing scam going around that could leave buyers without a down payment. The scam involved hackers breaking into the email accounts of real estate professionals and consumers to access information about home buyers’ closing dates. Once the hacker has the closing date, he’ll send an email to the buyer posing as the real estate professional or title company, according to the NAR. The scammer will say there’s been a “last-minute change” to the wiring instruction for closing funds and instruct the buyer to send the funds to a different account. That account, of course, really belongs to the hacker. According to the FTC, buyers who fall prey to this scam could find their bank account cleaned out in “a matter of minutes” – and it’s unlikely they’ll ever see that money again. “Buyers should be wary of sending financial information over email, downloading attachments, or responding to email requests to wire money in a real estate transaction,” said NAR President Tom Salamone. If you’re giving your financial information on the web, make sure the site is secure. Look for a URL that begins with https (the “s” stands for secure). And instead of clicking a link in an email to go to an organization’s site, look up the real URL and type in the web address yourself. Be cautious about opening attachments and downloading files from emails, regardless of who sends them. These files can contain malware that can weaken your computer’s security. 736,000 anuualized rate, the highest peak since November 2008.
family homes – rising to their highest levels in more than eight years. than multi-family,” says Jonathan Smoke, Realtor.com’s chief economist. One million borrowers regained equity in 2015, bringing the total number of mortgaged residential properties with equity at the end of Q4 2015 to approximately 46.3 million, or 91.5 percent of all mortgaged properties, according to the new CoreLogic® analysis. Nationwide, borrower equity increased year over year by $682 billion in Q4 2015. The CoreLogic analysis also indicates approximately 120,000 properties lost equity in the fourth quarter of 2015 compared to the third quarter of 2015. The total number of mortgaged residential properties with negative equity stood at 4.3 million, or 8.5 percent, in Q4 2105. 2015 and a decrease of 19.1 percent year-over-year from 5.3 million homes, or 10.7 percent, compared with Q4 2014.
mortgage debt or a combination of both. Last week, U.S. 30-year mortgage rates finished the week around 3.6%. As an American, it sounds outrageous to even consider that they could go lower. But when you take the rest of the world into account, it’s not as outrageous as it seems. Where do mortgage rates come from? Who decides what they will be? Look closely at this list… One of these four is not like the others. Which one is it? It doesn’t take long to realize that U.S. interest rates are dramatically higher than the rest of the developed world. Keep this in mind: Money flows where it’s treated best. The difference between U.S. rates and the rest of the world is simply too great for investors to ignore… Money is about to flow into the U.S.
Investors who have their money in low-paying bonds in Germany, Japan, and Switzerland will move some of that money into higher-paying U.S. bonds. That will put downward pressure on long-term U.S. interest rates. 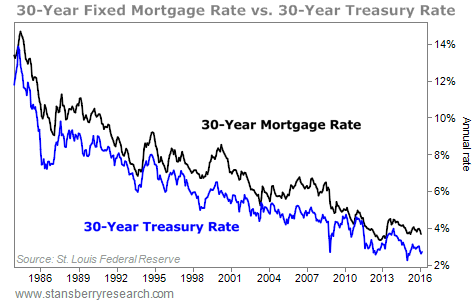 And the chart above shows, if U.S. interest rates on 30-year government bonds go down, U.S. mortgage rates will likely follow them lower. indicator improved by nine percent in 2015, its best showing since September 2013. Washington (+12.58 percent) and Nevada (+12.54 percent).